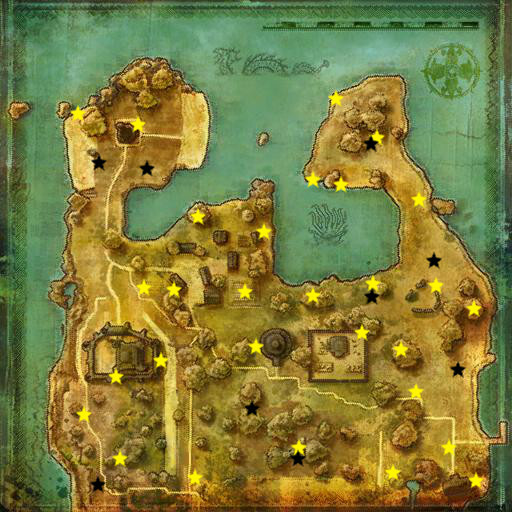 The map below shows all the present locations and black hat mobs that I know about so far. I know that there are others that I am missing, and this map will be updated as I find more. Yellow stars are presents, black stars are black hat mobs. There is one at the se corner of the castle, actually just north of the SE corner. Thanks for the help! I added both to the map, and found one more along the way. There are now 22 presents and 3 black hats on the map. From the forums, people are saying that there is a present on the beach, and one at the crossroads. I haven't found them yet. They are also reporting that there is a black hat mob in croockback in front of bonehead. I haven't seen him myself, but multiple people are saying that he is there. Someone also said that there is a black hat flamebringer at the beach, but I haven't seen him yet either. He will be carrying a torch. There is also one right when you enter the gates outside of the tavern. And a suggestion: why not do a spawn map for the Tavern, Arena, and Castle?